This is a very helpful post for Moms with colicky babies by Sara of My Merry Messy Life. Summer Herbs. Gripe water is a home remedy for infants with acid reflux , colic, stomach upset, teething pain, and other stomach ailments. Sara had used commercial Gripe Water with her 3 babies. However, when she checked the label she found it contained high fructose corn syrup, which worried her. So she started researching natural alternatives. She arrived at a blend of herbs that are used to treat colic in babies, indigestion, water retention, and more. Sara shares two different ways to make Gripe Water with these herbs. The recipe is very easy ~ it’s really just making a blended tea. Sara specifies how much to give your baby. She also cautions that you should check with your pediatrician before giving your child herbal medicines. 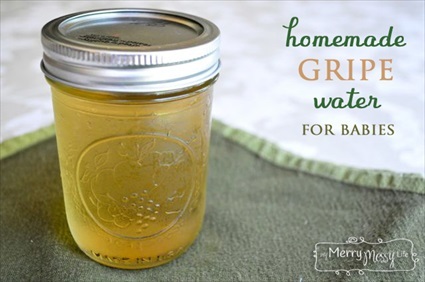 Click on the Homemade Natural Gripe Water for Colic in Babies link below to see the remedy.